Alfalah Institute of Banking and Finance was established in 2012 at Bahauddin Zakariya University Multan. Within a short span of three years, the institute has managed to establish its mark and has attained recognition as a primer institute of South Punjab. Efforts have been made to develop a strong research culture within the institute and students are encouraged to undertake practical projects and research studies. 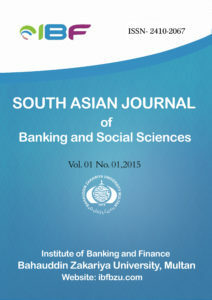 South Asian Journal of Banking and Social Sciences (SAJBS) is an effort of the institute towards this cause. 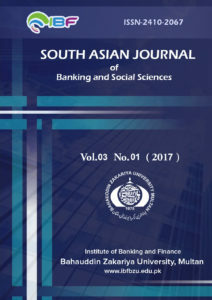 Purpose of this research journal is to publish original and quality research in the disciplines of Banking, Finance, Management and Social Sciences. The journal is published in accordance with the guidelines issued by Higher Education Commission, Pakistan. SAJBS is a double-blind peer reviewed journal that will be published on bi-annual basis by Bahauddin Zakariya University, Multan. The research papers included in the journal covers a wide variety of subjects, both applied and theoretical in nature. The aim of SAJBS is to be widely accepted and read amongst university teachers, researchers, governmental and non-governmental institutions. Researchers, Scholars, Students are invited to contribute their original research papers / review papers / articles and book reviews. The articles should reflect some creative thoughts with respect to the field of management sciences and business administration. The submitted paper must be the original work of the author(s). The papers must be submitted in good English and must not have been submitted/ printed elsewhere. Only electronic submissions in MS word format (.doc/.docx) are acceptable. The submitted papers will be submitted for plagiarism testing. Papers that exceed a minimum threshold for plagiarism will automatically be rejected. Detailed author guidelines are available on the website of SAJBS. Confirmation emails will be received within 72 hours of submission. The intimation for publication will be sent as soon as peer review reports are received by the editor. Views expressed in SAJBS are only those of authors and not those of editor or publisher. The authors are responsible for their view articulated in their papers published in SAJBS. Authors are will be responsible in case of any subsequent violation of copy rights or patents. ©2018 IBF BZU ALL RIGHTS RESERVED.